When you save presentation as a PDF file it freezes the formatting and layout. People can view the slides even if they don’t have PowerPoint, but they can’t make changes to it. Click Create PDF/XPS Document, then click Create PDF/XPS. 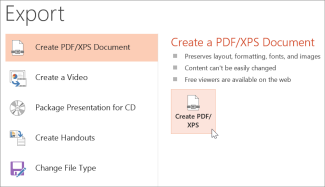 In the Publish as PDF or XPS dialog box, choose a location to save the file to. If you want it to have a different name, enter it in the File name box. At Optimize for, select Standard for higher quality (for example, if you want to print it). Select Minimum size to make the file smaller (for example, if you want to send it as an e-mail attachment). To save the current slide only as a PDF, under Range, select Current slide. To save specific slides as PDF, in Slides(s), enter the slide number range in From and To boxes. If you don't want to save slides, but instead only save comments, handouts, or Outline view, under Publish what, select an appropriate option. You can also specify the number of slides to appear in Slides per page dropdown box, and modify the order (Horizontal or Vertical). You can choose to include frame slides, hidden slides, comments, ink, non-printing information such as Document properties or Document structure tags, in your PDF by selecting the appropriate options. There are two ways to make your PowerPoint for macOS presentation a PDF. 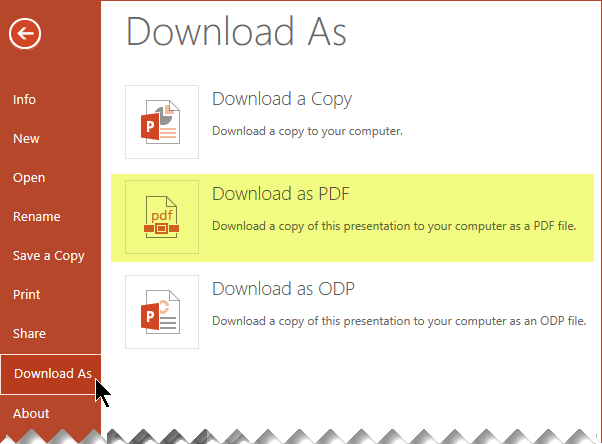 You can save your presentation as a PDF in File > Save As. 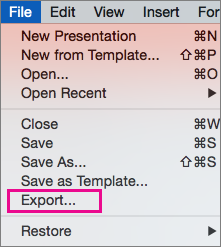 You can export your presentation as a PDF file by going to File > Export. Both methods do the same thing, so you can choose whichever you're more familiar with when you want to create a PDF version of your presentation. Choose the location where you'd like to save your PDF, and then in the File Format menu, choose PDF. 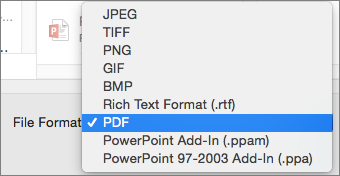 In the File Format menu, choose PDF. Note: If you'd like to have more options to customize PDF conversions of presentations in PowerPoint for macOS, please add your suggestions to the PowerPoint Suggestion Box. Features such as saving notes, saving slides as handouts, including hidden slides in the PDF, or setting the PDF to a smaller file size aren't available . 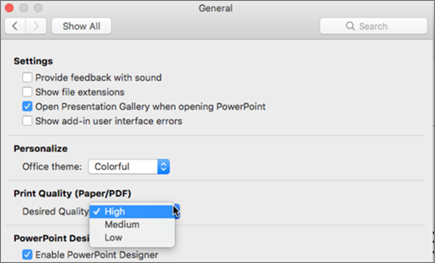 However, in newer versions of PowerPoint for macOS, after version 2011, you can set the print quality of a PDF to a higher or lower standard. Click the PowerPoint menu > Preferences. In the PowerPoint Preferences dialog box, click General. Under Print Quality (Paper/PDF), set the Desired Quality to an option of your choice. Click the File tab, click Download As, and then click Download as PDF. (The file is converted to PDF, and then a dialog box tells you that it is ready to download. 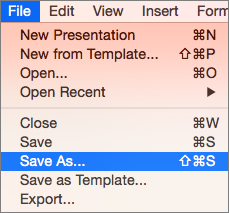 Click Save As, and then a dialog box appears that allows you to specify where to save the file on your computer.